Say cheese: Father Michael with a wheel of caciotta. It takes some very happy buffaloes from Tamil Nadu and a group of happier monks from Kerala to make some of the freshest Italian mozzarella cheese in Bangalore. This could arguably be one of the best-kept culinary secrets in town. Chefs in Italian restaurants in Bangalore will seldom admit to this—choosing instead to imprint on menus that the mozzarella in your mouth flew in on the red-eye from Milan. The monks follow the tenets of St Benedict—ora et labora (prayer and work)—but because they have to lead a sustainable life, they turned to cheese-making as a means of income. 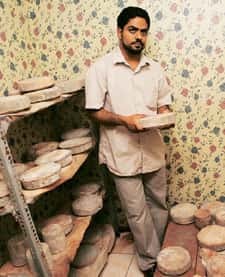 Michael KL, whose Italian is as fluent as his Malayalam, is the monastery’s master cheesemaker. He spent eight years in Italy. “We were thinking about what kind (of) work we could do to supplement our income," he says. “It was then that I thought of setting up a ‘cheese factory’ like the ones I had seen during my years in Italy." The Vallombrosan fathers (members of the Vallombrosan Benedictine Congregation, part of the International Benedictine Confederation) then began their homework. “We travelled all over the country to source the right kind of milk," recalls Michael. “It was then that we discovered that no one was producing buffalo milk cheese in the country." So the small group of monks started making buffalo milk mozzarella, at first producing small batches of the cheese for their own kitchens. Three years on, the city’s top Italian and continental restaurants and chefs—Herbs and Spice, Via Milano, Olive Beach, Gian Carlos’ Place, the Leela Palace—buy Vallombrosa cheese. The order also exports to Singapore. A herd of happy, grass-fed buffaloes in Hosur provides the milk. Six days a week (the monks take a break on Saturday), approximately 160 litres of milk lands up at the small cheese factory. The milk is heated and gradually curdled (an all-vegetarian process). Once curd forms, it is cut, drained, cured in a scalding brine bath and shaped into balls while hot. The monks check random samples for elasticity and consistency. Once cool, the cheese is packed in light brine and sent off. According to the monks, they are often told by the Italian expatriate community in Bangalore that some of the cheeses are much better than what they get back home. “I buy the bocconcini for salads and the mozzarella for pizza," says expat-Italian Paolo Nonino, who is chef and managing director of Via Milano. “The mozzarella they make is very good and melts very well. I buy more than 15kg each week. (And) the cheese they make is affordable and local." The factory makes around 40kg of cheese every day, including mascarpone (where cream is added for a soufflé-like consistency). Fresh cheeses are ready in about 6 hours and can be eaten once cool; the artisanal hard cheeses take two months to mature. A few select wheels sit in an air-conditioned maturing room where mould covers the cheese, forming a natural rind and adding depth of flavour. “We don’t put in additives and the fresh cheese is kept under refrigeration and consumed as soon as possible," Michael says. “The hard cheese, which is great for grating, gets better with age." 9am-6pm. Gualbert Bhavan, Sacred Heart Road, TC Palya, KR Puram, Bangalore (28474227). No credit cards. 9.30am-8.45pm. MK Retail Stores, 374, CMH Road, Indira Nagar (41269725). All major cards accepted.